Each season we're exposed to multitude of new styles and trends created by fashion designers throughout the world. Some don't even make it to the clothing rails as they are immediately rejected by not just the press but also buyers. Whereas others are an instant hit. The way in which fashion change is described is known as a fashion cycle. The fashion cycle is said to be a period of time or life span during which a trend or style emerges and moves through the five stages of the cycle of existence. Not only do designs go through these stage but so do fabrics, colours and textures. So what is the fashion cycle and what are the stages... The five different stages in which styles go through are; introduction, rise, peak, decline and rejection. Designs, trends, styles etc. are first brought to our attention during the four main fashion weeks; New York, London, Milan and Paris. From there the trend starts off on a few and eventually goes mainstream, by which time the leaders or the ones that started the trend - be the designers, models, celebrities or trendsetters - have moved on. As we begin to enter the rise stage, styles start to become mass-produced and more mainstream. Mass production reduces the price of fashion allowing more and more people to keep up with the latest trend without breaking the bank. Everything is absorbed much quicker and we want it now. During it's peak, fashion is at it's most popular and accepted stage. If the fashion is in such high demand what manufacturers will often do to prolong it's popularity is update the design or colour, or create something that will be seen as a classic piece season after season. Not only will they bring out adaptations but manufacturers must also carefully monitor the sales trend to keep up with demand or produce less if sales start to fall. After time demand starts to decrease and more often this decline will be just as quick as the rise of popularity. People become bored and start to tire of the style. The garments are still worn but consumers no longer want to buy them at regular prices. 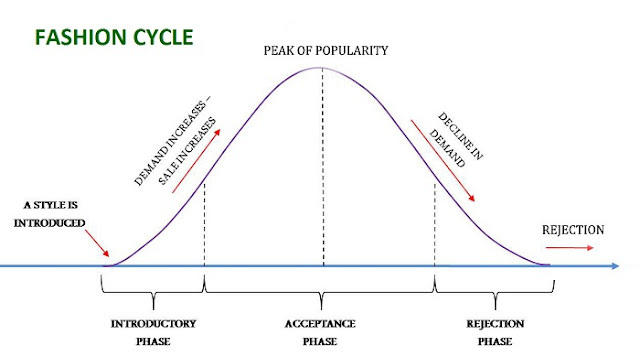 Once it drops off the radar into the rejection stage, consumers start to look for something new and the cycle starts again. Once a style has entered the rejection stage, then it can be re-discovered. The inspiration behind most designers is the past, but the design must have a different angle the next time around.